Lamb and mint are a natural pairing and they go together perfectly in this dish. This was one of those dinners where you're sad when it's over because you're not still eating it! 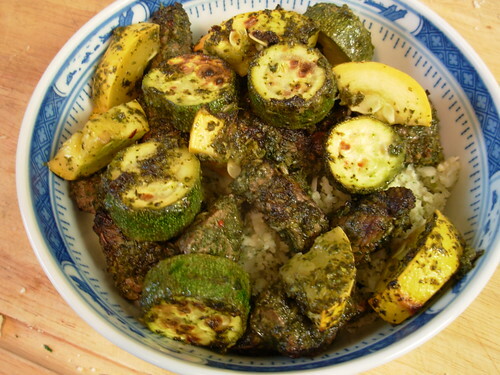 Combine the pesto with the lamb and vegetables and leave to marinate 2 hours or overnight. Preheat your broiler. Line a large baking sheet with foil. Drain the lamb and vegetables (reserving the marinade), place on the baking sheet, and broil 7-10 minutes or until desired doneness. Recipe is heavily adapted from "5 Square Low Carb Meals" by Monica Lynn. In the old days I would have eaten this with rice, so instead I made up some cauliflower rice to act as a bed for all the delicious juices. 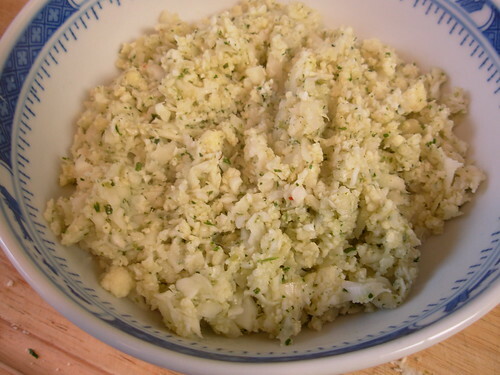 Heat 1-2 T of olive oil in a large pan and start to saute the grated cauliflower over medium heat. After the pan has gotten nice and hot, add the reserved pesto and the chicken stock. Continue sauteing, stirring, until the cauliflower is al dente. Don't cook it too long or it will turn to mush. I estimate this takes 5-7 minutes, but just taste it as you go and pull it off the heat when it's done. I pack my husband's lunch every day, and about 99% of the time it includes a salad. Usually I just throw together some extra virgin olive oil with whatever vinegar looks good, but sometimes I like to change it up a little. 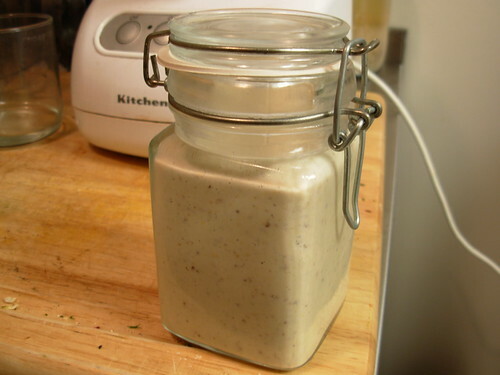 This tahini mustard dressing is one of his favorites. It's super thick and creamy, but 100% dairy-free! The dressing is very versatile too. As well as using it for dressing salad greens, it's great as a substitute for mayonnaise in chicken/tuna salad or cole slaw. It's also delicious as a marinade for grilled or broiled chicken. It will keep for at least a week in the fridge, but it never lasts that long around here. Just dump everything in a food processor and let it rip for a few seconds to combine. It will be very runny initially, but it will firm up significantly in the refrigerator. Enjoy! Recipe adapted from The Garden of Eating by Rachel Albert-Matesz. As time goes on I have been pondering more and more the role of vegetable fats in paleo/primal eating. The only vegetable oils I use are extra virgin olive oil, coconut oil, and to a much lesser extent palm oil, but I use them a lot - especially the olive oil. I cook just about everything in it and I also pour it all over my salads and steamed veggies. Before paleo I used to joke there was butter in my veins - now I joke they run with olive oil! Is this a good thing though? Olive oil is far more processed than animal fat and has a far different fatty acid profile. I have a hard time imagining vegetable fats being a big part of our ancestor's diets unless they happened to be lucky enough to live in the land of coconuts. Anyway, I'm not about to give up olive oil for salads, but for general cooking purposes I've been considering making the switch to animal fat. I joined the Polyface Farm buying club recently and I was excited to see that they had pig fat for sale for $1/lb. Perfect for making lard! I thought I read it came in 5-lb bags so I placed an order for one. Well, when it was delivered, I ended up with a 14.5 bag of fat! Turns out they come in approximately 10-lb bags (not 5-lb) and the one I happened to get was a little overfilled. Folks, this is a lot of pig fat. 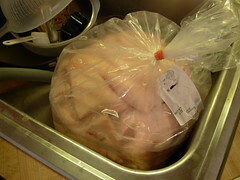 My package of fat taking up half the sink! My sister (who you may remember from her guest post) came to visit me this weekend and we decided to have ourselves a lard rendering party. Fourteen and a half pounds is a lot to render at once, so we let it thaw just a bit and peeled some pieces off the top to work with and put the rest back in the freezer. 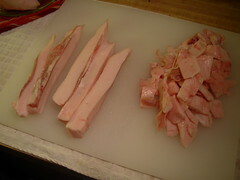 First, my sister diced the fat up. This bubbling pot of wonderfulness smells FANTASTIC. You can't imagine how good it smells unless you've done it yourself! 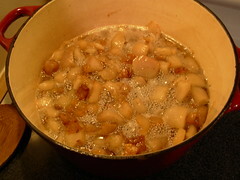 We left it over very low heat, stirring occasionally, until most of the cracklings started to sink to the bottom. 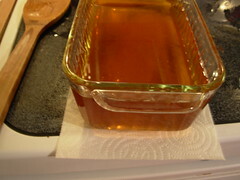 Once that happened (it took several hours), we poured it through a strainer into a container to cool. This stuff is pure liquid gold. After chilling out overnight in the fridge we ended up with a container of pure white lard ready to be used in any and all cooking applications. 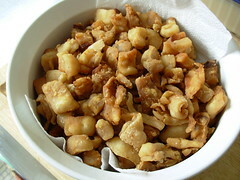 We also have an incredible snack - the leftover cracklings! I haven't been posting as much as I would like. I've taken some pictures of our food lately but I haven't had time to sit down and write anything up until today. Here is something we ate tonight. It is a delicious paleo beef stew with Spanish flavors. 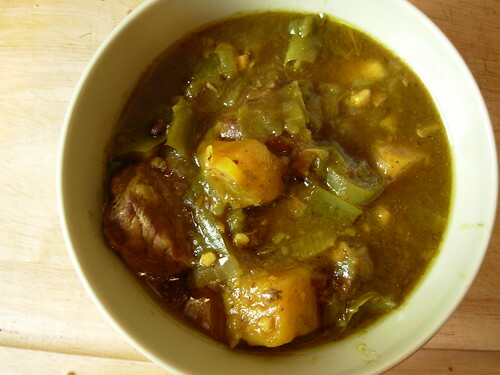 The original recipe is "Beef and Potato Stew with Saffron from La Mancha" from the book "Real Stew" by Clifford A. Wright. I had never used cloves or saffron in a stew before, but the result was amazingly rich and delicious. I think this may be my new favorite beef stew! Layer the olive oil, bell peppers, onion, garlic, and beef into a stew pot in that order. Layer the potatoes on top of the beef. Add the salt, pepper, cloves, bay leaf, and saffron. Pour the wine and beef broth over and add enough water to come to the top of the potatoes but not cover them. 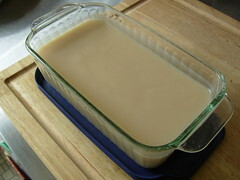 Bring to a boil, reduce heat to low, cover, and simmer until the meat is very tender, about 2 hours. The broth is relatively thin at this point. If you would like a thicker stew, with the pot still on the heat dissolve the arrowroot in 2 T cold water and stir into the stew. *note: Some people don't consider potatoes to be paleo. I find them acceptable on my personal version of the paleo diet, but if you'd rather substitute a different root vegetable I think that rutabaga would work the best. My husband likes sausage for breakfast, but it's hard to find pre-made breakfast sausage that isn't full of questionable additives, fillers, and/or nitrates. This breakfast sausage recipe is really easy to make and contains none of those iffy ingredients. I make up 1 or 2 pounds at a time and keep them in the fridge for up to about a week. If you want to make up even more at a time, you can freeze the patties in an airtight container separated by layers of parchment paper. Mix all ingredients together and chill for at least an hour to let the flavors meld. 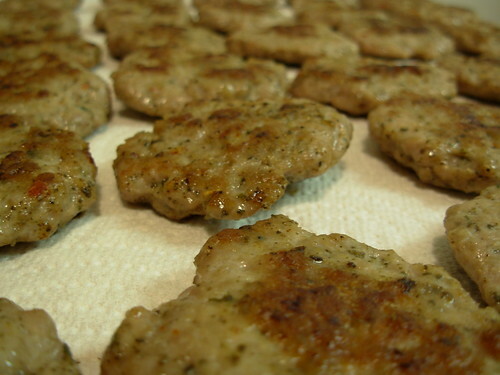 Form it into patties and saute until nicely browned on both sides. If you use turkey you might need to grease the pan a little, but if you use pork it should produce enough of its own fat. Recipe is adapted from Nourishing Traditions by Sally Fallon. My little sister has been listening to me prattling on about food and nutrition for years now. She's been in college though, where it's really difficult to have the time and/or attitude to care about what you're eating or to cook properly. Now that she's getting to the end of her senior year, she decided to take the plunge into paleo about 2-3 weeks ago and she's already feeling better and losing weight. Still being a college student though, she has let me know that a lot of the recipes I post just don't work out for her because she doesn't have the time or facilities. With that in mind, she has offered to write a guest post about how to do paleo when time is a definite factor. I hope you enjoy! 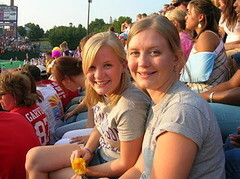 I'm Laura... 22, *almost* a college graduate, and a lover of all things fatty. I really enjoy cooking, but as a college student, I rarely have enough time for drawn out slow cooked meals (unless it’s in a crockpot). Another obstacle I have to overcome is living with two of my conventionally educated best friends who worry about me eating bacon, loads of olive oil, and no uber-"healthy” whole wheat. But alas, I love eating like a cavewoman. My mouth, stomach, and over all well being love it too. I came to the realization that I don’t ever want my meals to take longer than 30 minutes to prepare. If it’s going to take longer than a half hour, I probably won’t do it. Most of my meals involve cutting up a bunch of veggies and some sort of meat (usually chicken) with some spices/herbs, both pan fried in olive oil. The combinations of vegetables are virtually endless, but one of my favorites is zucchini, yellow squash, onions, and red peppers. I usually cook the onions the longest, and put the peppers in right at the end because I don’t like the mushy texture of fully cooked peppers. I make a huge skillet full of veggies that looks like way too much for one person. It usually gets put into a serving bowl, spiced protein on top, and voila! yummy, nutritious food that I can eat while reading or in front of the TV. Another super simple meal is a can of tuna tossed with olive oil, vinegar, and salt & pepper which I throw on top of some greens and whatever vegetables I have in the fridge that haven’t been stir fried yet. Sometimes I don’t come home from doing work on campus until 11 pm and by that time I’m usually hungry again. I’ll either make 2 fried eggs in olive oil (mmm delicious protein and fat!) or I'll have a handful of nuts with some berries. My favorite nuts are walnuts and almonds, and I get frozen berries because they are cheaper and never go bad. It’s a win-win situation. 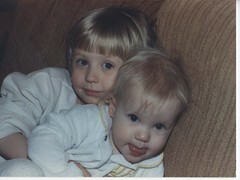 Thanks again to my sister for the great guest post!